New year. New you. That is, until halfway through January when the diet comes crashing down with that sneaky slab that’s been hiding in your grocery cupboard. Yes, it’s a familiar tale that so many of us tell each and every year. This year, instead of trying to eat less, work out more and everything in between, why not start habits that your whole family can reap the benefits of? We might be approaching February fast, but it’s never too late to start a good habit – check out our inspiring ideas below! It’s no secret that children who read – or who is read to, are more inquisitive, have a bigger imagination and have a higher vocabulary than those who don’t. Ultimately, experts believe that reading is the key to learning! So, this year, make a concerted effort to read with, to or in front of your kids. Bedtime stories is always a fun way to get the whole family involved; for those children who have outgrown bedtime stories, keep them interested by reading – together as a family – chapters from classic adventure books like Harry Potter, The Chronicles of Narnia, The Jungle Book or even Lord of the Rings. And don’t forget that kids learn habits and attitudes from parents, so make an effort to show your kids how much you love reading. Switch off the television and hide your phones/tablet in favour for a great novel – you’re bound to encourage your kids to follow in your footstep. For all the good that the digital age has brought to the world, it has certainly made it easier for fake news, real news, bad news, sad news and no news to pervade every area our lives. It’s so easy for us to cultivate negative attitudes nowadays. Instead, stir up positive mind-sets and encourage a brighter outlook on life by setting up a regular family gratitude practice. This can be anything from asking each person in your family what they’re grateful for today, when you’re eating dinner together or when you’re reading bedtime stories; or you can start a daily family gratitude journal where each person gets to draw a picture or write something they are grateful for in their day. Now, doesn’t that sound like a grand idea? Let’s face it, that one to two hour window between waking the kids, feeding them breakfast and getting them to the school are the stuff nightmares are often made of. Start a habit this year to set out everything you need for the next morning the night before – this includes setting the breakfast table (to a point where all you need to add is the milk), pack lunch boxes, let your children lay out their school uniforms in their rooms, and ask them to pack their suitcases and leave it near the front door. Another trick is to add a whiteboard near the front door; on it you can list all items that you must remember to take with you, which you can then tick off as you have them the next morning. These simple steps will guarantee that there will be less rush and panic in the mornings, which will set your kids off to a good start and you to an even better start! We get it: an evening in most households is manic with homework, playtime, bath time, and mom and dad’s work overtime; for many parents, they’re just grateful that their kids had a mouthful of the mac and cheese they prepared and that they’re kids went to bed on time. This year, turn the things upside down by prioritising that the whole family sits down to dinner together. 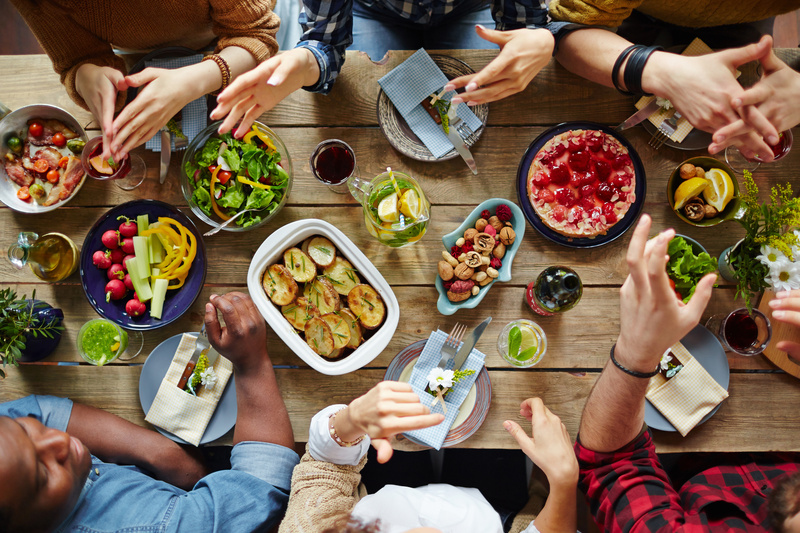 Block out a non-negotiable 45 minutes in our evening schedule where your family can enjoy a meal together, connect and catch up (it’s a great opportunity to introduce your gratitude practice here!). Plus, research has shown that families, who sit down to a meal, eat more veggies and less fried foods. Healthy body equals a healthy mind, and vice versa. It’s so easy to look at the bigger picture when setting goals for the year: “I want to lose 5kgs by December”; “I want to have read 15 books by the end of the year”; “I want to go to Greece for a holiday this year”. Big goals are good and important to include in your plans for each year. However, it’s as important to set smaller goals that you can aim to achieve throughout the year – it develops determination, purpose and willpower! For example, at the start of each school term, ask your child to list three things they want to achieve during the school term – it can be anything from making a new friend to reading a bigger book or improving the mark they got for subject the term before. Up the ante for achieving those goals by offering your child a small reward if they meet their goals at the end of the term. One of the easiest ways for these ideas to turn into habits is to include it in your everyday routine. How do you form a routine? By doing the same things repeatedly… in other words, creating a habit out of it. Routines have proven to lead to better sleeping habits in adults and children and it can help set a positive attitude to the challenges of each day. And the more we do it, the easier it will become! So, now it’s your turn to tell us what habit are you going to start in 2019?